A sports package includes larger wheels and a more ground-hugging stance, as well as an aero kit that reduces drag and increases down force at speed. Although the X6 styling still won’t be an object lesson in functional design, the coupe crossover does get a dose of practicality. A redesigned (and better looking) stern improves visibility and creates quantifiably more rear headroom. Wider rear doors ease entry and exit. That said, the pseudo SUV also gets an even more dynamic looking greenhouse. New front and rear fascias round out the update. BMW is expected to release the third iteration of the popular X5. Six months later, the new X6 is scheduled to see the light. Both models are based on a new components set known in-house as “X for all,” a result of BMW’s growing interest and expertise in all-wheel drive. For the X5 and X6, “X for all” means new axles derived from the 5-series sedan. They will, according to BMW, help reduce the weight by up to 330-pounds. As a result, the lightest X5 replacement is said to undercut the two-ton mark by a small yet significant margin. An unfortunate victim of this new design is the X6’s torque-vectoring rear differential, which works magically but adds weight and cost. Instead, BMW intends to offer the optional active steering, a self-leveling air suspension and Adaptive Drive, which employs adjustable anti-roll bars to suppress unwanted body movements. The three-way damper calibration system (normal, sport, comfort) and the related engine/transmission control are expected to be no-cost parts of the X5/X6 parcel. The two crossovers also introduce an array of driver assistance devices that likely preview what’s to come on the next 3-series. Among them are lane departure warning and compensation devices, night vision, park assist with surround view cameras, traffic sign recognition and active cruise control that allows the vehicle to come to a complete stop and accelerate up to speed. All-new styling for the X5 likely refrains from the swoopy swooshiness of Adrian van Hooydonk’s most recent creations like the 6-series coupe. The cabin layout is said to be remarkably close to the 5-series Gran Turismo, which is doing extremely well in China. Expect extras like a full-length glass sunroof, power-operated rear seats, and a much more practical split tailgate with a lower section that folds up rather than down. When BMW swapped in the chubby 5-series GT for the 5-series wagon in its U.S. lineup, aficionados of the 3-series wagon (including us) began fretting that their beloved carryall would be yanked from our market, too. Fortunately, the 5-series GT has failed to move the needle at all with traditional wagon buyers, and BMW didn’t want to completely abandon its slice of annual station-wagon sales in the U.S. (about 10,000 to 15,000 units per year). So it lives. Hallelujah. The 2014 Touring, as the Germans call it when they’re not using its F31 internal code, adopts all the changes from the new F30 3-series sedan. (It’s sold here as the 3-series Sports Wagon.) Despite what we’d previously been told, the only model making the transatlantic trip will be the 328i, motivated by BMW’s 2.0-liter turbocharged four coupled exclusively to an excellent eight-speed ZF automatic. (That means no 300-hp 335i, no diesel, and no manual.) Buyers again will have the ability to choose between rear- and all-wheel drive.Wagon a More Roomy TailFollowing the example of the F30 sedan, the new wagon is longer than the last model; the stretch here is 3.4 inches, two of which have been added to the wheelbase. The extra length adds 0.7 inch of rear kneeroom and bumps luggage capacity with the rear seats folded by 4.0 cubic feet to 64.9.The lift-over height into the cargo area is lower than on the preceding car, and the liftgate opening is several inches wider for easier loading. The hatch is now power operated, and the rear window once again can be opened independently of the sheetmetal. BMW offers the hands-free ability to open the hatch by waving your foot under the bumper, provided the proximity key is with you. This is a feature we’ve seen on European Passat wagons and the latest Ford Escape.There are a couple of storage compartments under the trunk floor. The forward one has some deep wells, and the rearmost one can hold the roll-up luggage cover when you need it out of the way for taller cargo.Overall, the new model looks a bit sleeker, thanks to the increased length and a beltline that rises more sharply than before. Inside, the wagon looks just like the latest sedan. It has all of that model’s new features, such as the engine stop-start system; an “eco pro” driving mode; electrically boosted steering; and Sport, Modern, Luxury, and M Sport trim options. The list includes an available head-up display and an automatic parking system.Drive One, and You’ve Driven Them BothThe 2014 wagon drives much like the sedan, feeling poised and balanced overall. The steering is a little light and lacking in feel, but it is accurate. Torsional stiffness is said to be up by 10 percent, and the wagon certainly felt solid and was particularly quiet, which is not easy to achieve when the cabin is so large and extends over the rear axle.The turbocharged four pulls strongly, and we estimate a 0-to-60-mph time of about six seconds, or 0.3 to 0.4 second slower than a 328i sedan. Even in throttle-dulling eco-pro mode, the transmission is always willing to find the right gear quickly, according to the demands of your right foot. The stop-start system stays out of the driver’s way in operation, but you definitely know when the engine turns on and off. Engine noise and vibration at idle and during startup will have to be reduced by an order of magnitude before these systems become transparent. The new Sports Wagon will go into production next spring and arrive here shortly afterward. Pricing hasn’t been announced yet, but if we apply the sedan-to-wagon increase from the prior generation to the new one, we’d expect a base price of about $40,000 for the rear-drive wagon and a two-grand premium for all-wheel drive. For fans of station wagons, the fact that a new five-door 3-series is here at all is good news. That it looks great and drives competently might be considered bonuses. BMW’s Z4 is the mostly classically proportioned roadster on the market, with a miles-long hood, a pert rounded tail, and a narrow cabin set just ahead of the rear axle. The latest iteration, which debuted in 2011, saw the designers smooth out the sheetmetal, eliminating the swoops and slashes that marred the first-generation Z4. We thought the Z4-based Zagato Roadster shown at Pebble Beach last summer might have portended a new look for the production car. Instead, BMW has given its drop-top two-seater the mildest of updates for 2014. Styling tweaks include a redesigned headlight cluster, which now features an LED strip atop the dual round headlights and available 18-inch wheels with a new V-spoke design. The most eye-catching change for 2013 is the optional Hyper Orange package ($950), which replaces last year’s Citrus Yellow package. With it, you get Valencia orange exterior paint (other colors are available) and a black interior with orange accents. Alcantara trim panels on the doors and lower dash are orange (or, alternately, black), and orange stripes run down the center of the seats, while a metal-weave trim strip brightens the dash. The orange-and-black theme on our test car was taken a step further by the optional black top; fans of a contrasting-color roof can also choose silver. The retractable hard top folds and stows in just under twenty seconds and can do so with the car on the move at up to 25 mph — just make sure the divider in the trunk is in the correct position. With the top up, there’s a decent amount of luggage space, but with the divider in place to allow top-down motoring, that total shrinks to just 6.4 cubic feet. If you want to drive al fresco, pack very light, or else your passenger will be traveling with their bag on their lap. The Z4 interior carries over — well, OK, there’s new black trim around the vents and a new wood trim is available — but the in-car electronics march ever forward. BMW’s ConnectedDrive system now allows drivers to receive Internet radio stations via a linked iPhone; it also adds the capability to have Facebook and Twitter posts displayed on the navigation screen or read aloud. The latter doesn’t exactly strike us as a good idea, however.The Z4 continues to be offered in three strengths: 28i, with a 240-hp 2.0-liter turbo four-cylinder; 35i, powered by a 300-hp 3.0-liter turbo six-cylinder; and 35is, boasting a 335-hp version of the same turbo six. (All Z4 models also wear the sDrive label, indicating that they’re rear-wheel drive.) Our test example was the 35is. Its extra power over the 35i comes with no fuel economy penalty — it’s rated at the same 17 mpg city/24 mpg highway. You do, however, lose the option of a manual transmission, as the 35is comes only with BMW’s 7-speed M-DCT dual-clutch automatic, while the 35i also can be had with a 6-speed stick. With the manual, the 35i does get better gas mileage, up 2 mpg in both city and highway driving. Of course, the real mileage champ is the four-cylinder 28i, which nets 22 mpg in the city and 33 mpg on the highway. The 335-hp engine and M-DCT gearbox do make for a potent combination, able to reach 60 mph in 4.8 seconds, and the straight six sounds great. A standard rocker switch can adjust the powertrain response among three settings: comfort, sport, and sport-plus; this feature is standard on all Z4 models. The 35is adds Adaptive M suspension (it’s optional as part of the sport package on lesser Z4s), and it, too, can be put in any of the same three settings. Whichever one you pick, the Z4 turns in sharply and has tons of grip, but the electric power steering is rather light and artificial. Overall, this car just doesn’t have quite the of-a-piece quality that characterizes its Porsche Boxster competitor. BMW is planning a few changes for its 6-Series lineup in 2014, and from an enthusiast perspective virtually all of them are positive. First and foremost, BMW has heard the complaints of U.S. buyers, and it will introduce a six-speed manual gearbox as a no-charge option on all 2014 M6 variants.That means you’ll be able to row your own gears in a 2014 BMW M6 Coupe, M6 Convertible or M6 Gran Coupe. In Efficient and Sport mode, the gearbox also provides rev-matching on downshifts, but this feature is disabled in Sport + mode. M Carbon Ceramic Brakes are an available option across the M6 range, and shed a total of 42.8 pounds of unsprung weight. The carbon ceramic rotors shed heat quicker than their (more affordable) cast iron counterparts, too, which should be a consideration for owners planning on regular track day use.New to the 6-Series product line for 2014 is the limited-production Frozen Brilliant White Edition Convertible, which comes in either 650i (rear-wheel drive) or 650i xDrive (all-wheel drive) versions. Just 100 will be built, each boasting a matte white finish, matte black mirror caps, black grille and 20-inch two-tone alloy wheels.Inside, the Frozen Brilliant White Edition Convertible gets black Nappa Leather upholstery, a black soft top, gray poplar wood trim, the M Sport Package, the Executive Package and BMW’s Dynamic Digital Instrument Cluster, which varies the car’s instrument display by the Driving Dynamic mode selected.All-wheel drive Frozen Brilliant White Edition Convertibles get the Cold Weather Package, too, and are priced at $110,095 including $895 for destination and handling. Rear-wheel drive Frozen Brilliant White Convertibles are priced at $106,695, also including destination charge. The other big news for 2014 is that all 6 Series models will come with BMW’s iDrive version 4.2, and xDrive now becomes an available option on 640i Gran Coupe models. Walkabout A sense of security pervades its every motion on the road, even when you’re busting through 100 mph on a riptide of—dare we say it?—profoundly diesel-like torque. The M5 flies through sweepers with a doctor’s note excusing it from Mr. Newton’s lecture, remaining flat and cool and seemingly impervious to the lateral forces that should roll it heavily to the outside given its relatively compliant suspension. You can starch up the shocks with the “Dynamic Damper Control” button, but even on “Sport Plus,” the car doesn’t tramp. The M5 spurns the electric-assist steering in lesser 5-series models for a more natural-feeling hydraulic boost. And thanks to sharper camber and caster settings, the car’s commitment to the driver’s desired trajectory is firmer than in the wandering 5s and 7s we’ve driven lately. When a hairpin comes up, the default stability-control mode is an intrusive buzzkill, cutting power and tapping the brakes even when the M5 seems well within its impressive cornering limits. Switch to the more playful M Dynamic Mode and you begin to see why; the rear just leaps sideways when kicked by the ol’ M TwinPower Turbo. To its credit, BMW avoided making the M5’s chassis too safe and dull by dousing it with understeer, even if increasing numbers of BMWs now sell in markets with, ahem, new drivers. In this department, the M5 is unquestionably an M. Stand down the stability control entirely and watch the M5 bonfire its tires drifting sideways, spitting smoke and chunks of expensive Michelin Pilot Super Sport rubber. Yet, a slight fog of artificiality is there. The steering does everything you could desire—everything, that is, except talk back with those little organic tugs and sags that make lively cars feel, well, alive. What does tug and sag a bit is the power delivery as the M TwinPower Turbo’s boost crests and falls. We’re not talking lag here because there really isn’t any, just faint disturbances in the g-force that will bother some old Jedi knights who love long, linear windups to stratospheric redlines. pposedly for track-day lappers who like to hold gears longer—and, we suspect, to uphold the M tradition of making spin-dizzy engines. The tall gearing of the seamlessly proficient seven-speed, with its two overdrive top gears handing off to a 3.15:1 axle ratio, is well matched to the M TwinPower Turbo’s torque curve, or lack of curve, as it were. The torque “peak” of 502 pound-feet is more of a mesa, arriving just off idle at 1500 rpm and not fading until 5750 rpm, ­figures for a gasoline engine that would make even Herr Diesel envious. Summary Change, like cold gazpacho, always has its haters. Atavists will doubtlessly cry out that M has abandoned them with all this turbo madness. To paraphrase a recent comment on our website: When the M5 got a V-8 for 1998, people said they missed the inline-six. When it got a V-10 for 2004, people longed for the V-8. 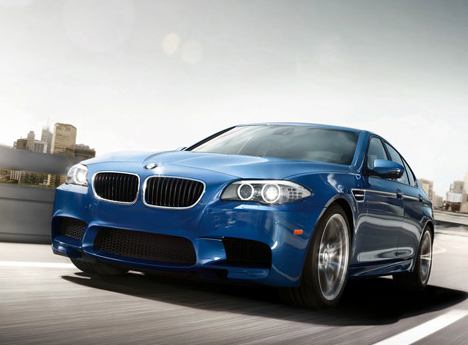 That is all true, as is the fact that the new M5 remains a delectably sweet reward for personal financial success. And if the next M5 is a diesel-electric hybrid that hits 60 mph in three seconds flat, will we say the same? Maybe, but only if BMW comes up with an even better name than M TwinPower Turbo. The 2013 BMW X6 combines some of the interior features and exterior features that are not used to be a vehicle that eventually attracted the attention not only for convenience and speed, but for tight engine engineered and unusual body. 2013 BMW X6 will be released early 2011 with a specific body styling will experience a new aerodynamic features similar to those shown in 2011 BMW X5.2013 BMW X6 has a high performance and rugged reliability, the plan 2013 BMW X6 will be priced around $ 60,000. BMW has an excellent track record in terms of maintaining high performance for several years, and require moderate maintenance. The main issues with this vehicle seems to how the driver decides to drive it, should it be used primarily as passenger vehicles, or as a fun excuse for outdoor adventures. As an SUV, the 2013 BMW X6 is a strong player, with a powerful 3.0 liter engine and turbo compressors. In past models, the engine has been featuring variable valve timing, and there is no indication that this will change in the model 2013.Additional benefit, the model 2010 which was released in 2009, includes four doors and an emphasis on providing the maximum amount of sporty handling and performance. This strange mixture of extreme emotions have gathered from the reviews, some really do like the 2013 BMW X6 combines break traditional barriers and otherwise apparently mutually exclusive properties, while another reviewer hated the typical bulk and weight of the vehicle in combination with aspects of performance should be high. Launched in 1999, the X5 is BMW’s flagship mid-size SUV, or as BMW calls it, a SAV, or Sport Activity Vehicle. From the very beginning, BMW worked hard to make sure that sporty driving dynamics and a high level of responsiveness were programmed into the X5. This means the X5 features not only great deal of utility, but with BMW’s standard all-wheel drive system, a sure-footed nature in a variety of terrains. Add to that BMW’s trademarked build quality and luxury, the X5 is a versatile vehicle that’s well-placed at the top of its class. Three trims are available, starting with the xDrive35i and topping out with the xDrive50i. A high-performance X5 M model is also available. Several engine updates were made for 2013, including a revised 3.0L inline 6-cylinder turbocharged engine in the xDrive35i that makes 300 horsepower. xDrive50i versions are fitted with a retuned all-aluminum twin-turbo 4.4L V8 with variable valve timing and direct injection. It features what BMW calls a “reverse flow” setup, with its twin turbochargers situated within the valley between the cylinders. It makes 400 horsepower and 450 lb-ft of torque. At the very top of the range is the intense X5 M, featuring 555 horsepower from a tuned version of the xDrive50i’s 4.4L V8.Both the xDrive35i and the xDrive50i use an 8-speed automatic transmission, first introduced in the 5-series Grand Turismo. Brake energy regeneration is also used on both gasoline engines, which uncouples the alternator from the accessory drive system, allowing the battery to only be charged during coasting or braking. This, BMW says, results in up to 2 percent fuel economy boost. The X5 M features a 6-speed automatic as the only transmission option.Standard safety features include a myriad of airbags–driver’s and passenger’s front and side units as well as head airbags for the first- and second-row seats. In addition, BMW offers Dynamic Stability Control, Dynamic Traction Control, Dynamic Brake Control, Hill Descent Control and Dynamic Cruise Control. Active Cruise Control and Lane Departure Warning systems are also available. There’s also a rearview camera that can provide a 360-degree exterior view, a Heads-Up Display that projects onto the windshield in the driver’s field of view and a Park Distance Control system that alerts the driver of obstacles behind the vehicle while parking. The xDrive35i is available in three trim levels, with the base model including automatic xenon adaptive headlamps, rain sensors, HD radio, fog lights, automatic climate control, cruise control, 18-inch wheels and an anti-theft system all as standard equipment. Premium adds 19-inch wheels, iPod integration, tinted glass, leather seats and the availability of a Convenience Package, Active Ventilated Seat Package, Cold Weather Package and Technology Package. The top of the line Sport Activity adds 20-inch wheels, sport seats, performance tires, BMW’s Adaptive Drive System and special darkened trim.